The Wall Street firm has snagged a hefty 12 times EBITDA from Invesco for its ETF unit. The buyer also bags a big tax break, but barely gains ground on industry giants. Guggenheim, meanwhile, pockets a welcome $1.2 bln distraction from months of debilitating executive squabbling. 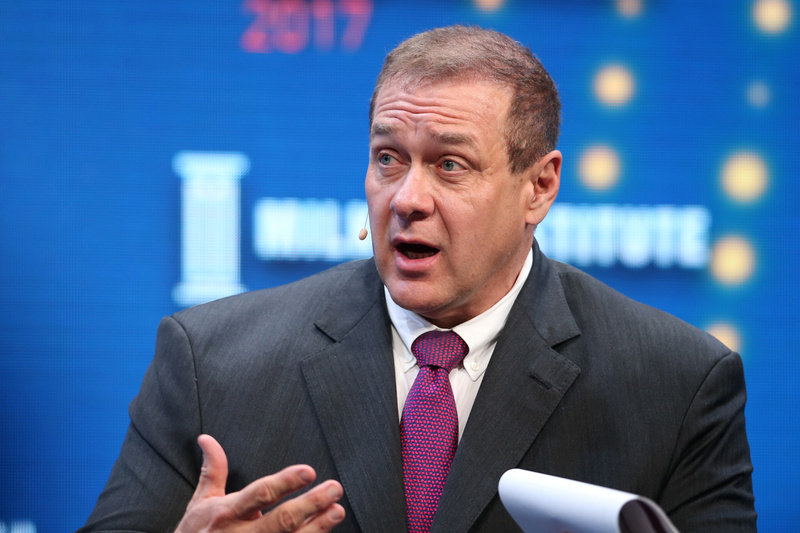 Scott Minerd, Chairman of Investments and Global Chief Investment Officer of Guggenheim Partners, speaks during the Milken Institute Global Conference in Beverly Hills, California, U.S., May 1, 2017. Invesco on Sept. 28 said it has agreed to acquire the exchange-traded funds business of Guggenheim Investments for $1.2 billion in cash. The unit manages 77 ETFs with a total of $36.7 billion of assets. It also has annual revenue of $108 million. The deal will boost Invesco’s ETF assets to about $196 billion. The acquisition “will enable us to provide one of the industry’s most comprehensive and innovative ranges of smart beta ETFs, including fixed income, equal-weight and self-indexed product offerings,” Invesco CEO Martin Flanagan said.